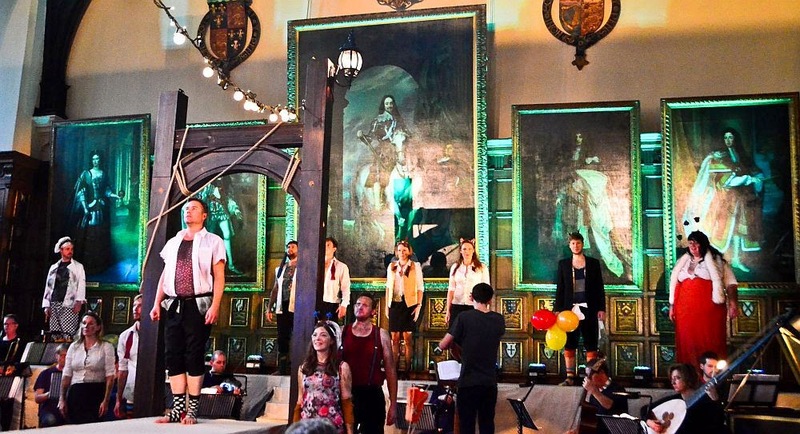 Purcell's magical opera spread fairy dust at the Middle Temple Hall. Directed by and starring Tomas Guthrie this was a sublime and surreal interpretation, updating without modernising Purcell's concept. 'The Fairy Queen' was first performed in 1692 in London and was revised by Purcell the next year when he added extra songs such as the song 'Fill up the bowl' for the drunken poet. Purcell loosely based 'The Fairy Queen' on Shakespeare's 'A Midsummer Night's Dream', written almost 100 years earlier. Much of the plot has already happened before the opera begins and assumes that the audience are familiar with Shakespeare's play. 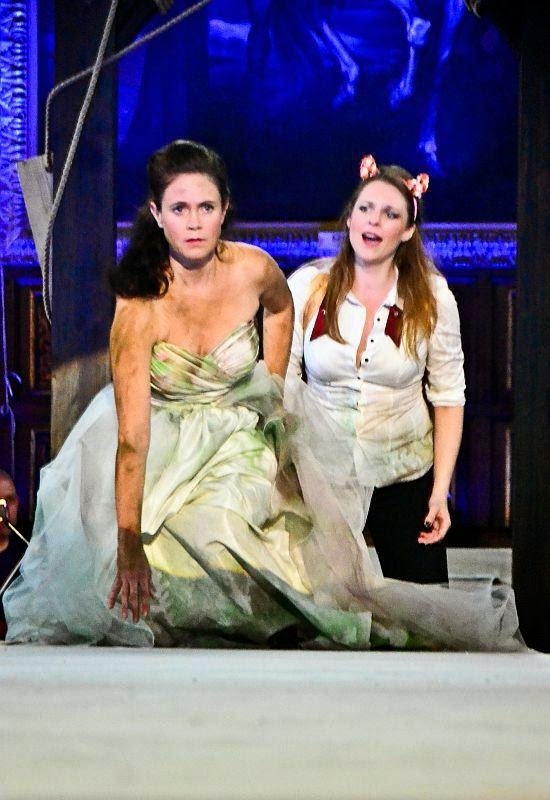 Unlike more modern dramatic operas Purcell's music is pretty much incidental to the play - the songs are sung by fairies, supernatural personifications, and sundry characters such as in the 'kissing song' which is sung by Coridon and Mopsa and not by the main protagonists. Not quite the puritan modern audiences might think, Purcell intended that the role of Mopsa be sung by a countertenor and Coridon by a bass, leading to humorous misunderstandings. Originally there would have been spoken dialogue, with the musical numbers coming at the end of each act. However the entire play is rarely performed now as it is about five hours long. Without this dialogue what remains is a somewhat surreal performance. In order to make some kind of sense of it all Guthrie had added some new text (in rhyming couplets) and changed the human characters from lovers to people to do with the theatre – an actor, a director, and two somewhat lost audience members - to provide a storyline into which Purcell's music could fit. 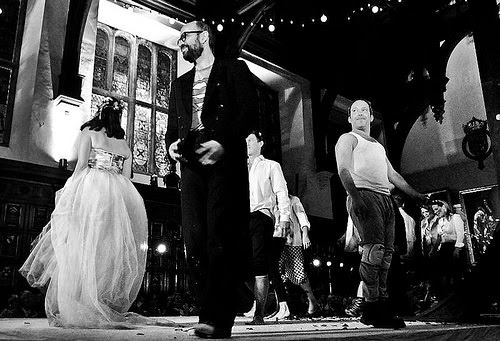 The costuming was simple but effective with the fairies changing from theatre ushers to strange, shabby, colourful creatures – some in faded grandeur, such as Titania in her grubby wedding dress and veil. The appropriateness of the late 16th century Middle Temple Hall as a setting for 'Fairy Queen', despite the difficulties of having a thrust stage to work on, are clearly shown by wall plaques proudly stating the theatrical premieres over the centuries – including that of Shakespeare's 'Twelfth Night' in 1602. The staging was minimal (designed by Rhys Jarman): a wood hinted at by some branches and lights attached to the stage scaffolding. But the company used their, and the audiences imagination, to transport us. The musicians (The Temple Players, conducted by Greg Morris) played from behind the stage, on the balcony and in the audience. The performers added atmosphere using 'Happy Birthday Oberon' party balloon, flowers, trick or treat sweets (well it was Halloween), and the passing of the seasons for the birthday masque was noted by petals, leaves and snow falling from the ceiling. Much use was made of quirky and interesting lighting effects courtesy of Katharine Williams. Some of the changes made I heartily approved of. 'The Plaint' sung by Cheryl Enever was the sorrowful hopeless cry of someone watching their beloved distraught friend Titania fall apart. The dance by Titania (Sarah Dowling - who did all the choreography) was a heartfelt and violently emotional outpouring of loss. This was moved to the start of the second half where its power was enhanced by its contrast to the end of the first. There was not a single weak performance. The fairies (sopranos Grace Davidson and Amy Wood) who sang the duets so beautifully ,baritone Gareth John (Winter and Hymen), were outstanding. Nicholas Merryweather filled out the comic roles: singing an oddly angry drunken poet, turning it into a fairy mimicking a drunken poet, which fit into the general idea so much better than having an extra, extraneous character to explain. He was also Corydon to countertenor William Towers' Mopsa. The other singers included Rachel Ambrose Evans, Jonathan Darbourne, Jamie Hall, Samuel Boden, Matthew Sandy, Andrew Tortise and Richard Latham. The non-singing roles were ably performed by Kit Benjamin as the Drunken Opera Goer and Margot Richardson as his wife, plus Mark Fleischmann (from Wolfblood) as the actor and Keith Hill as his director. Each of these roles was multi-faceted and the actors had to perform as the character and as the character under the spell of the fairies without spilling over into pantomime. Additionally they joined in the dancing – adding to the regal spectacle that was somewhat reminiscent of period dance (a microcosm for the production ethos) and the chorus. In writing this review I have scarcely scratched the surface of the delights of 'The Fairy Queen'. Unfortunately there were only two performances - it was a production that I could have easily seen again – and taken my friends along.